Sharkstooth. My first RMNP love. 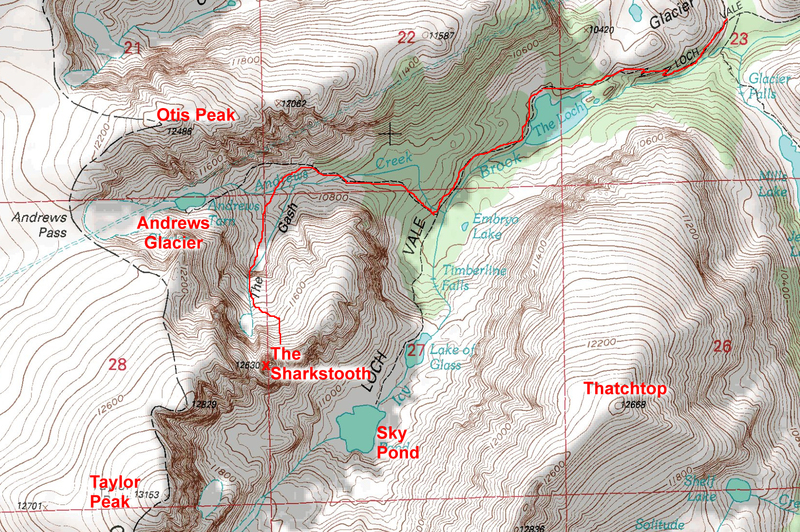 The Sharkstooth is well named. 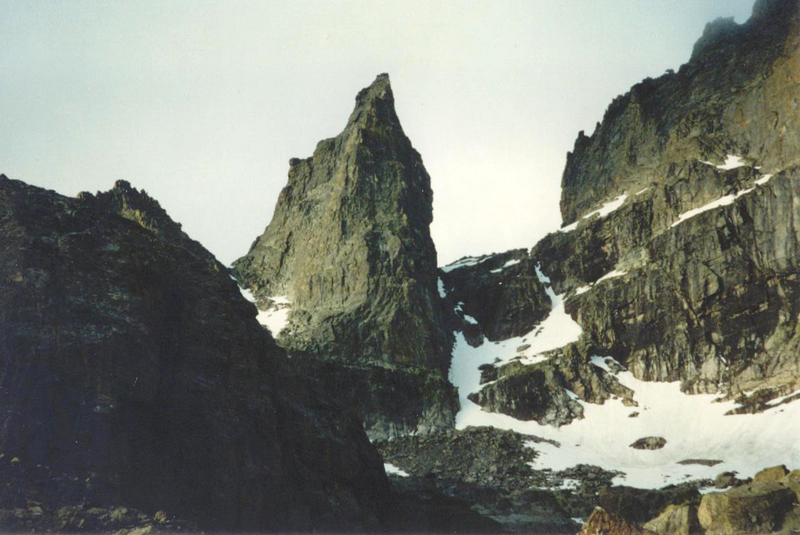 It is the highest (12,630′) of the Cathedral Spires group of pinnacles on the ridge that splits the Loch Vale area and separates the Sky Pond/Taylor Glacier area from the Andrews Glacier area. 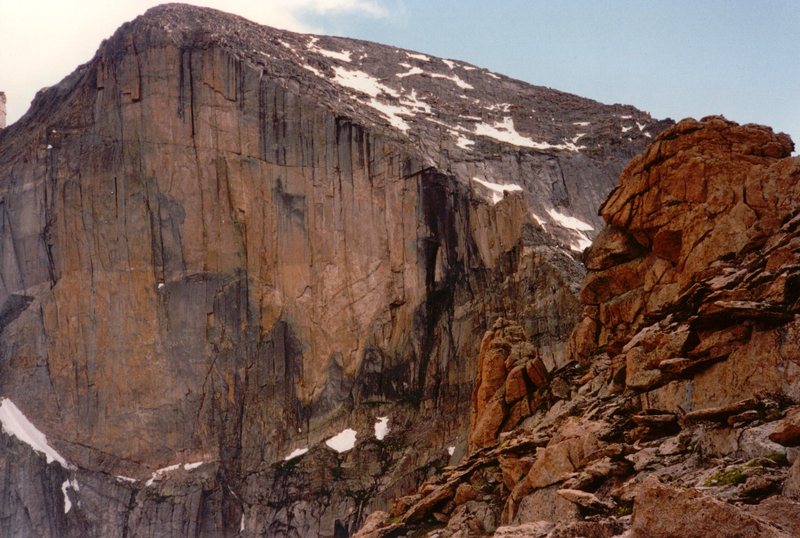 When viewed from below Andrews Glacier, it looks like a massive tooth jutting up from the jaws of the Earth. 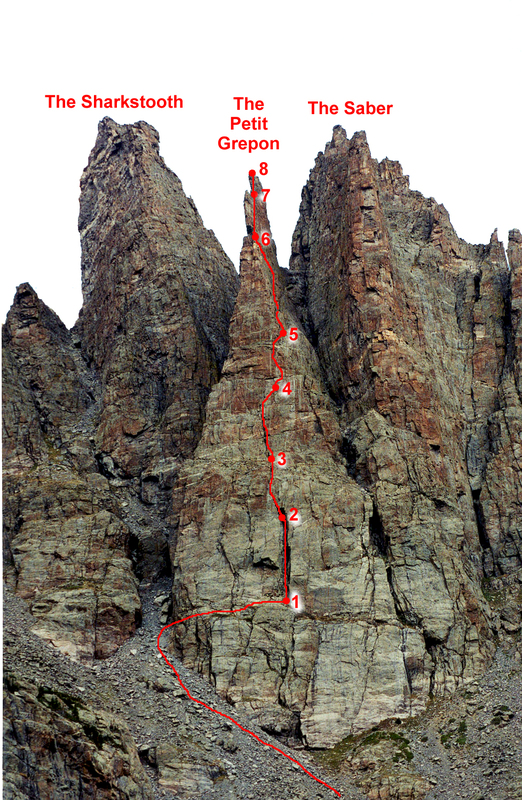 It is located just east of the Continental Divide and Taylor Peak, and is a stone’s throw from the popular Petit Grepon. life. 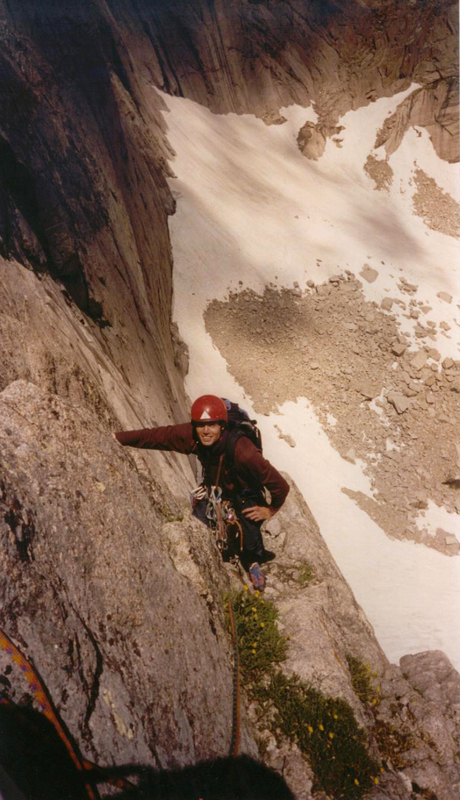 Fortunately, survival was not an issue; and in the months that followed, I couldn’t stop thinking about climbing more peaks. 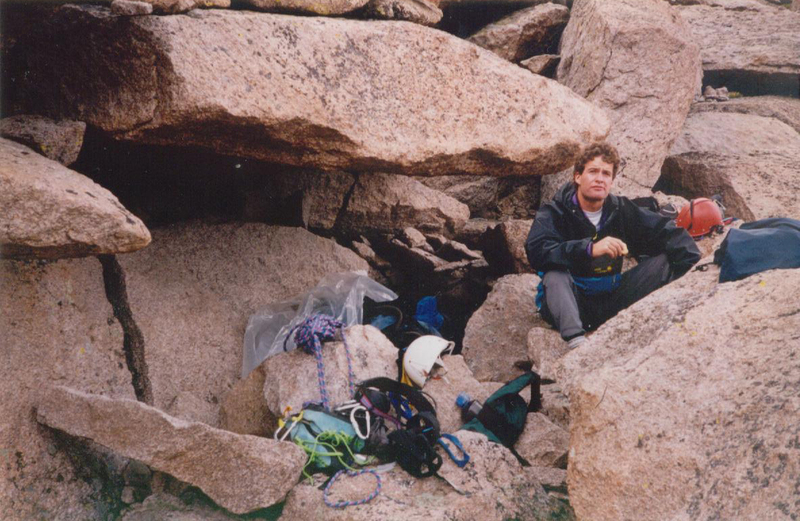 My inevitable return visit to Sharkstooth occurred in October 1996, and was the first climb I ever did with Brian. It was a freeze-fest due to the late season effort that concluded with a 4pm summit, leaving only 2 hours of light to rappel down and hike out (in case you don’t know, it takes at least 3 hours). And we didn’t bring headlamps. As you may guess, it was another epic experience, cementing the Sharkstooth’s place in my heart. 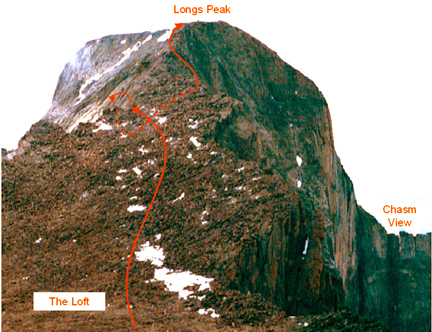 Despite being my first RMNP love, so many peaks to climb meant it would take 3 years before we’d return once again; and this time, to complete the North Face [5.8] route, the key factor in success would be perseverance. Return trips would come much more quickly, out of necessity. 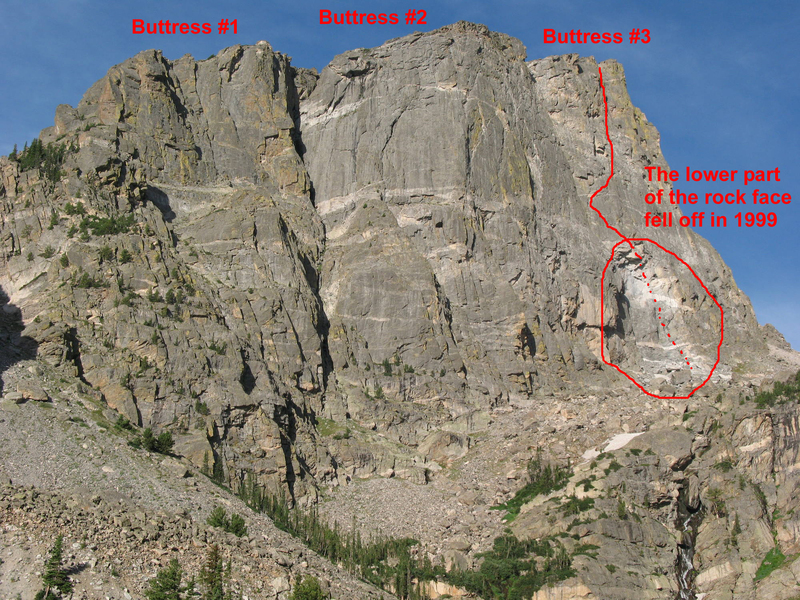 After digging deep into Rossiter’s guidebook, Brian had the idea of climbing the obscure North Face route [III, 5.8] which starts at the popular Northeast Ridge route but then spirals up and right around to reach the summit from the west side. 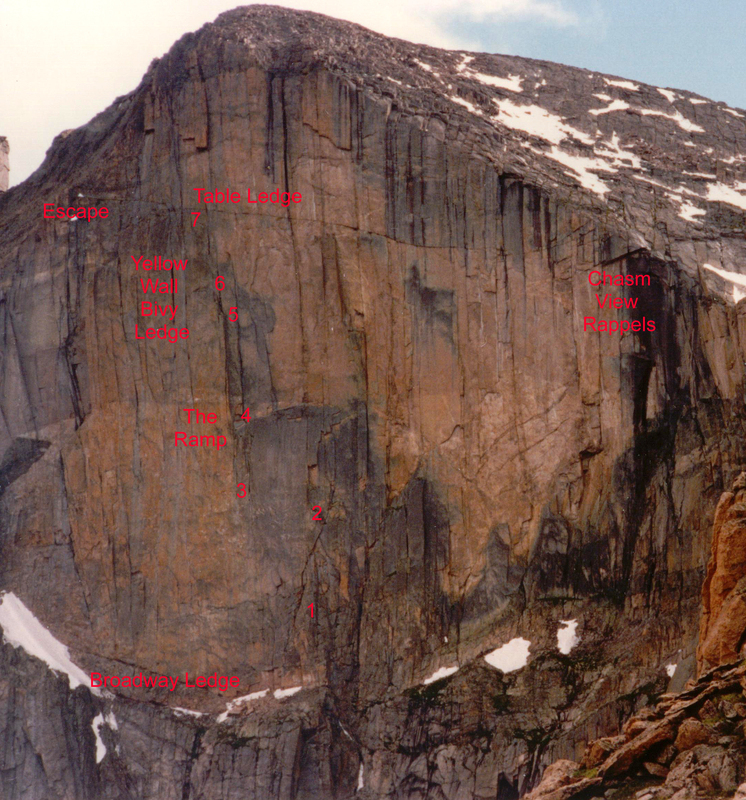 And on August 29, 1999, we set out to climb Sharkstooth once again. 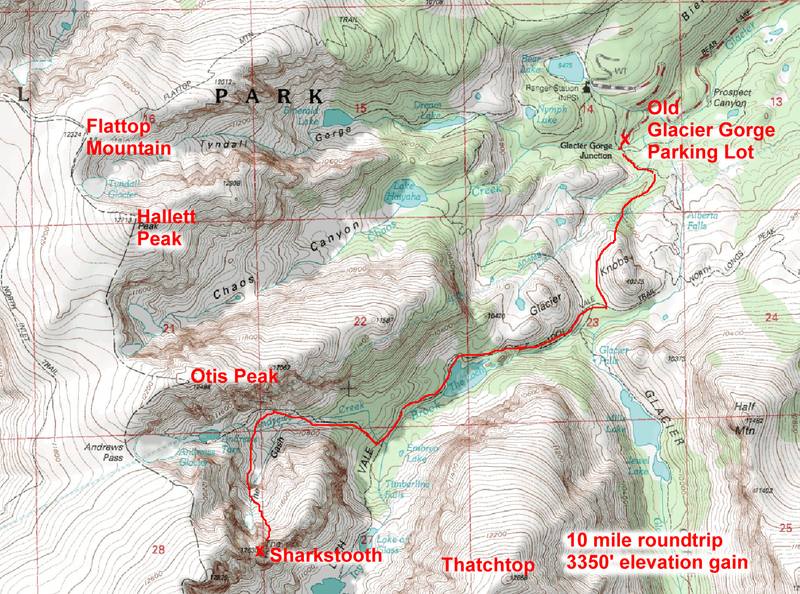 We drove into RMNP in the predawn twilight and parked at the now extinct Glacier Gorge access parking lot. With a quick sorting of gear, we were hiking at 5am. 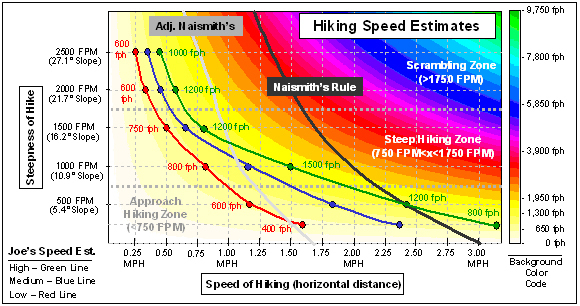 We kept up a good pace and reached the base of the climb at 8am to find the rock wet & very slippery. 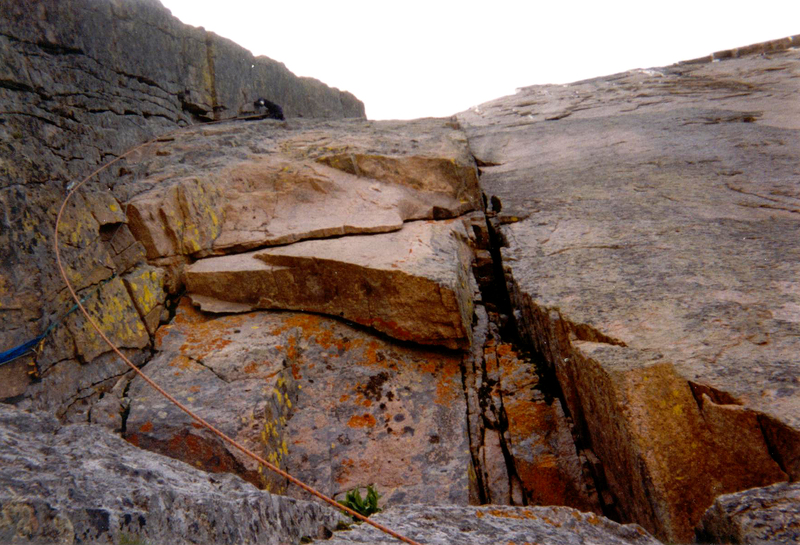 Our only hope was that the wind would dry the rock before the climbing got too hard. 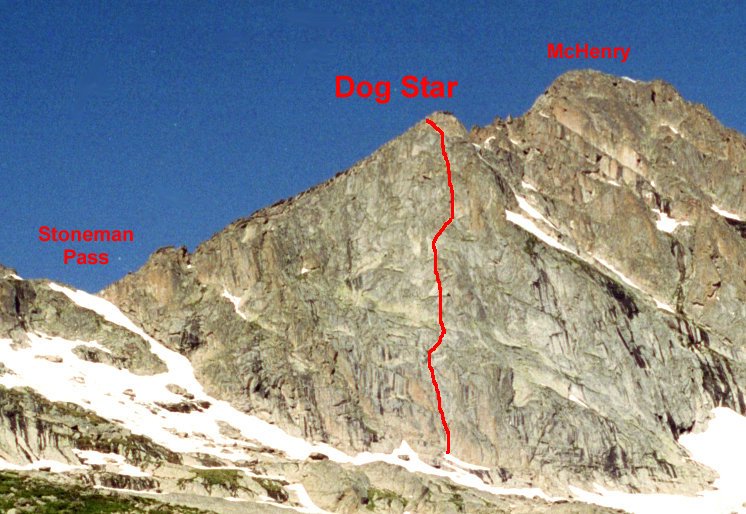 Progress made in initial attempt of North Face route on the Sharkstooth. 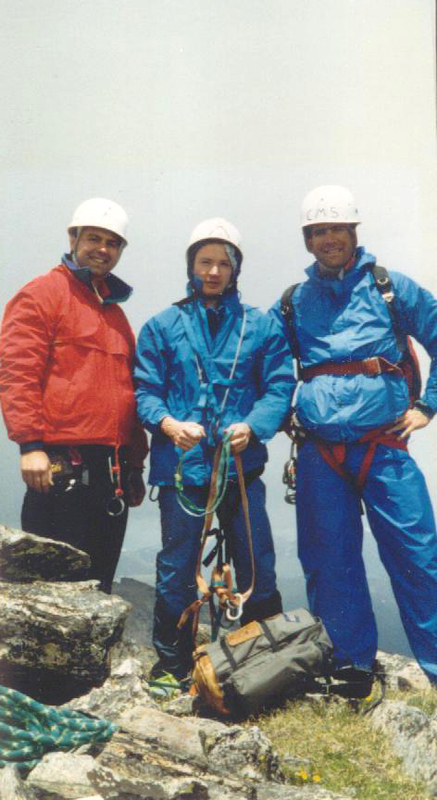 Photo from 1992 climb. 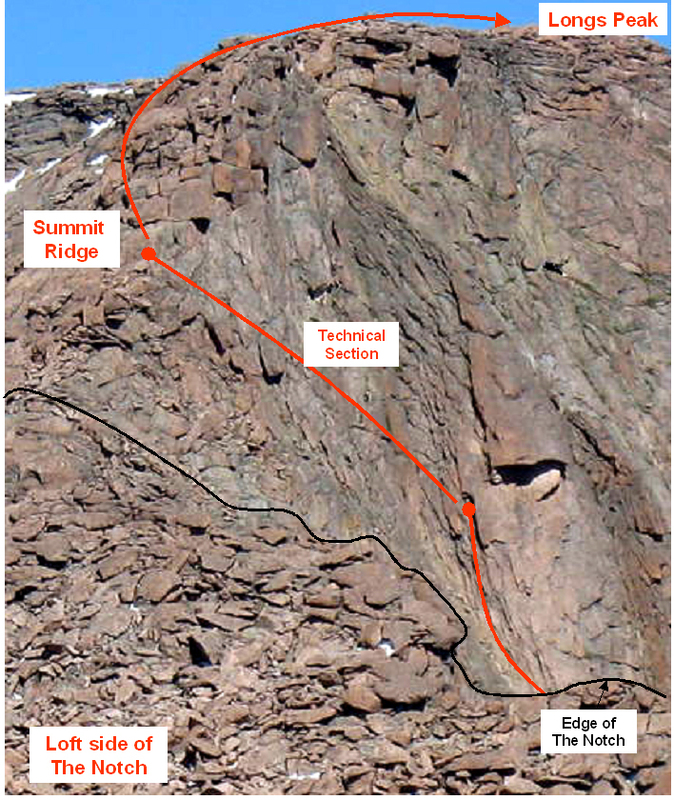 Essentially, he says to start at the SE Ridge route and go up and right. 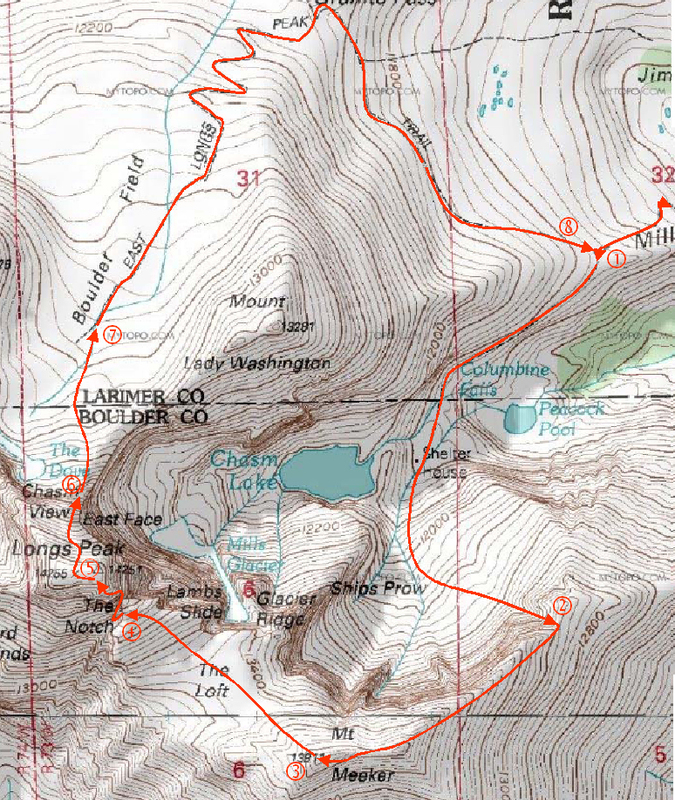 And the topo didn’t help very much either, as it just showed an arrow pointing around the corner of the NW arete. But that is okay; more adventure for us. We enjoyed and were good at route-finding. We just hoped we had time for that sort of adventure. 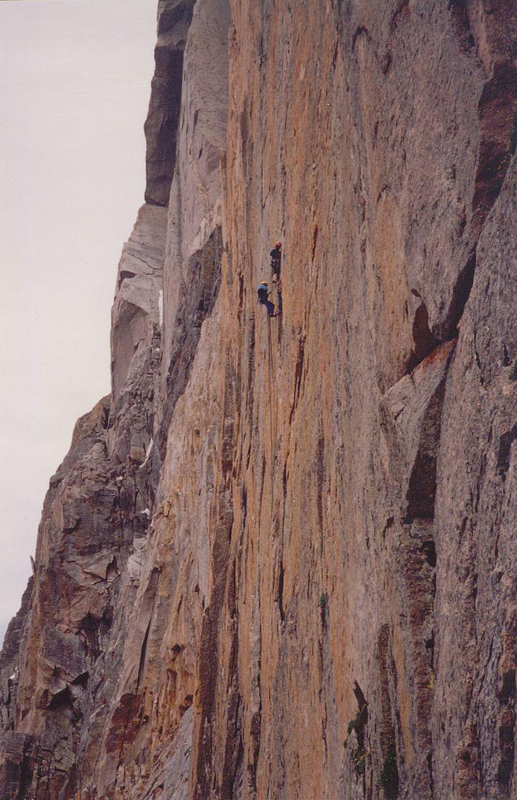 The first couple pitches were clean rock alternating with grassy ledges which brought us to the shoulder where we could see the north face above us. That was our last sunlight for the day. 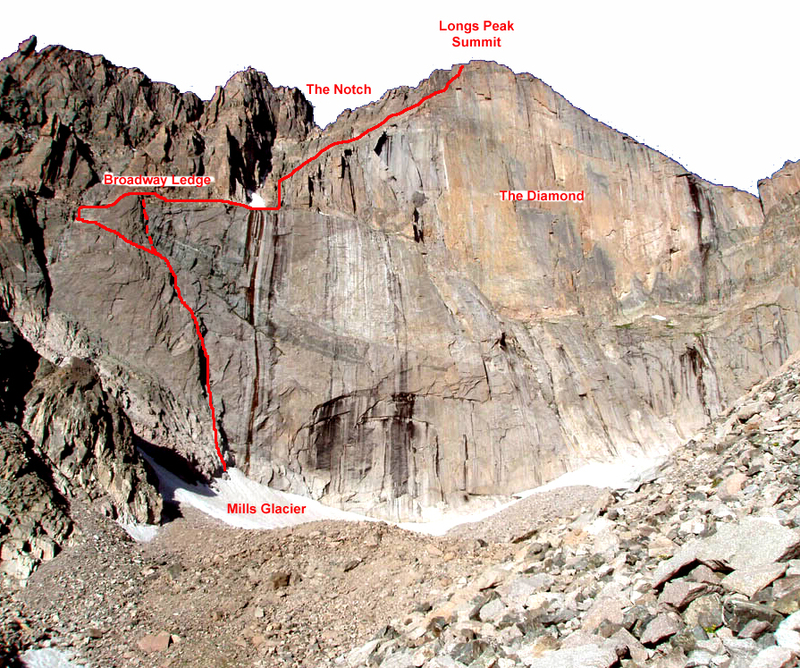 An ascending traverse right over broken terrain took us to the far right base of the north face. 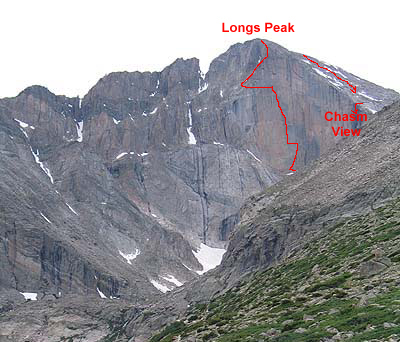 And by 11am, I found a windy belay perch on a ledge from where we could peek around the corner and see the steep unlikely-looking west side. 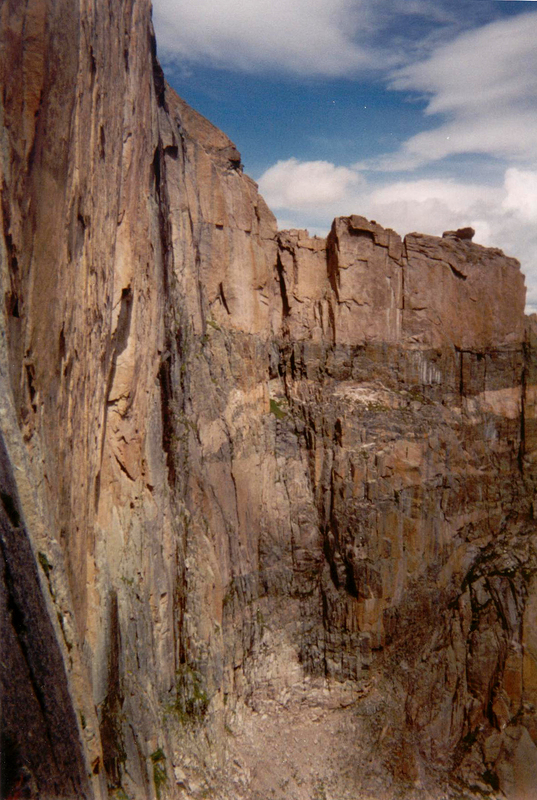 This spot was about 150 feet short of the summit (2 short pitches). And a few drops fell. In a valorous effort to intimidate the weather, Brian ignored the mosture and started up the pitch. I led over couple blocks, then onto a grand piano sized flake. It seemed like something we didn’t want the rope connected to. After some more traversing past a grungy flaring chimney, I could see the slope start to ease off above me. 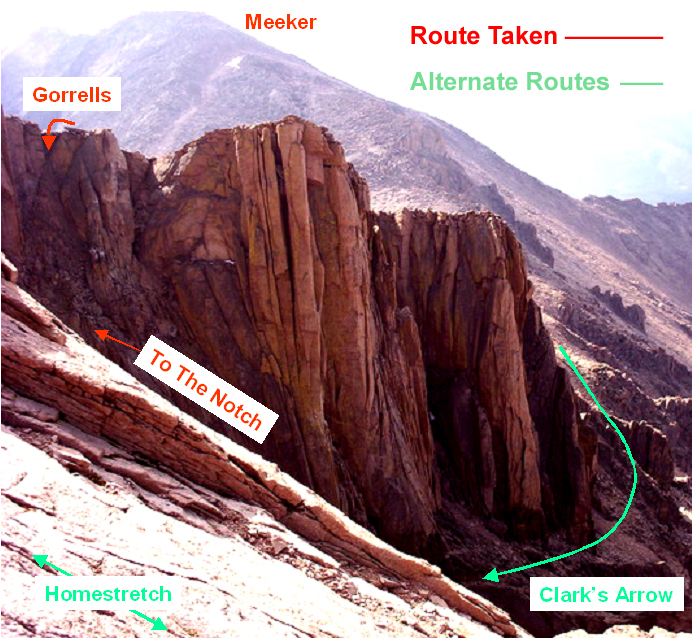 A couple more moves, and then I had my chin and a bomber brown tricam right at the crux move. We were fortunate to have the double ropes that day. I think he was tempted to push it, since he was so close; but since we were in a good position to retreat back down the path we had taken, we had to take the only safe option. 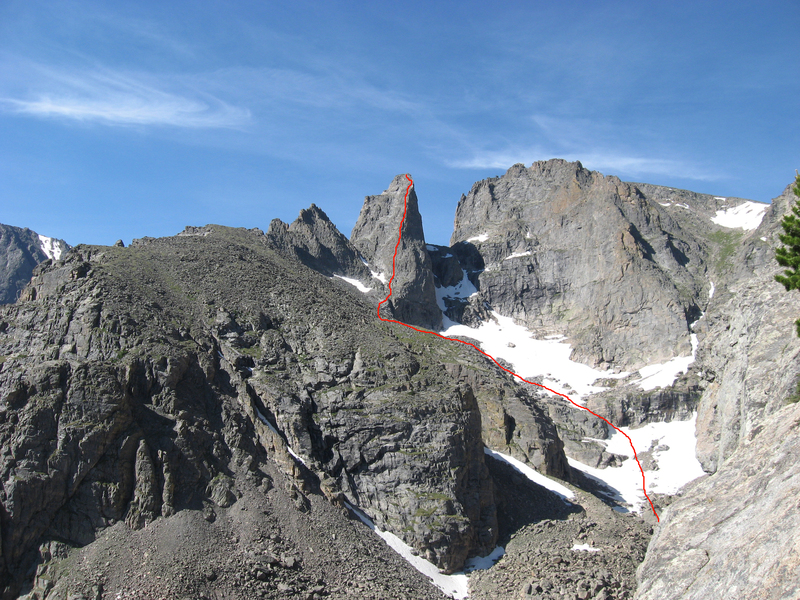 If we continued up our spiral route but didn’t make the summit, we’d probably have no choice but to try to rappel into the gully below us, between Taylor and Sharkstooth. 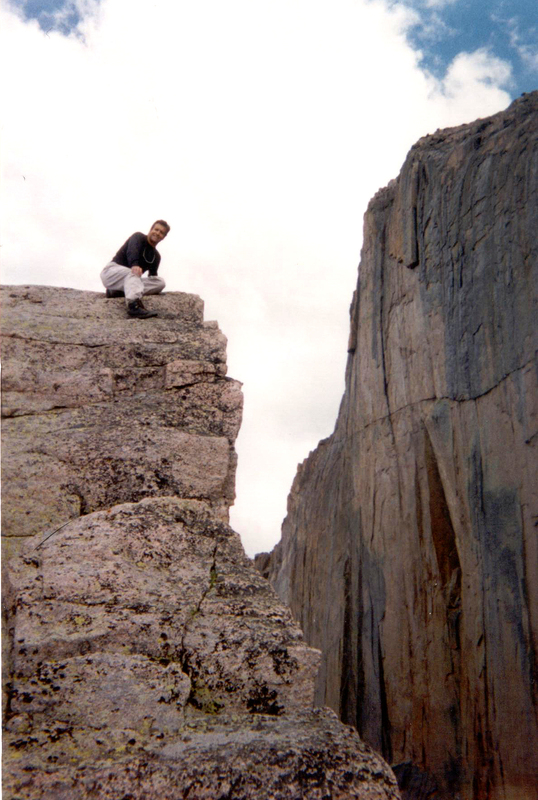 And since we didn’t know if such a rappel was possible or how dangerous it would be to escape from that gully if we reached it, well… it was another time for a bit of discretion. “Than as wyse and discrete he withdrewe him sayng that more is worth a good retrayte than a folisshe abydinge — Jason, Caxton (1477). Brian managed to escape his position losing very little gear. 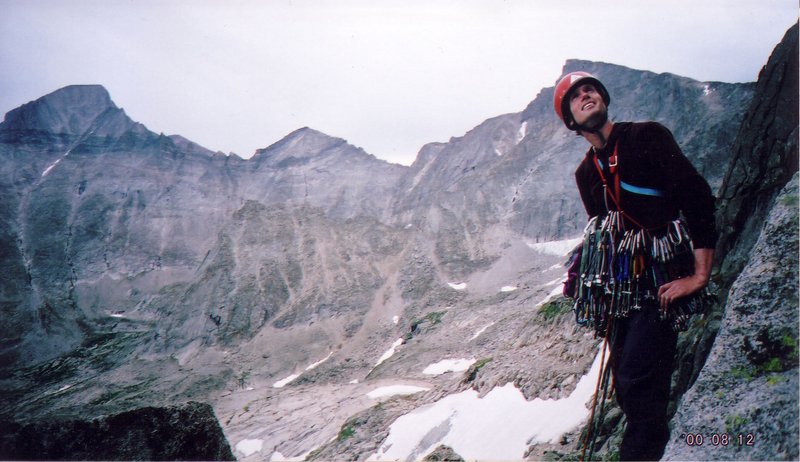 Then we backtracked around the North face and rappelled down the east face to our packs and the hiking terrain. And after the long, wet hike out, we reached the parking lot after a total of 11 hours of fruitless labor. It was only the 2nd time either of us could remember bailing on a climb; we agreed that we’d come back soon to complete the effort. We had tentatively set September 12th as the return trip, but the weather didn’t cooperate. 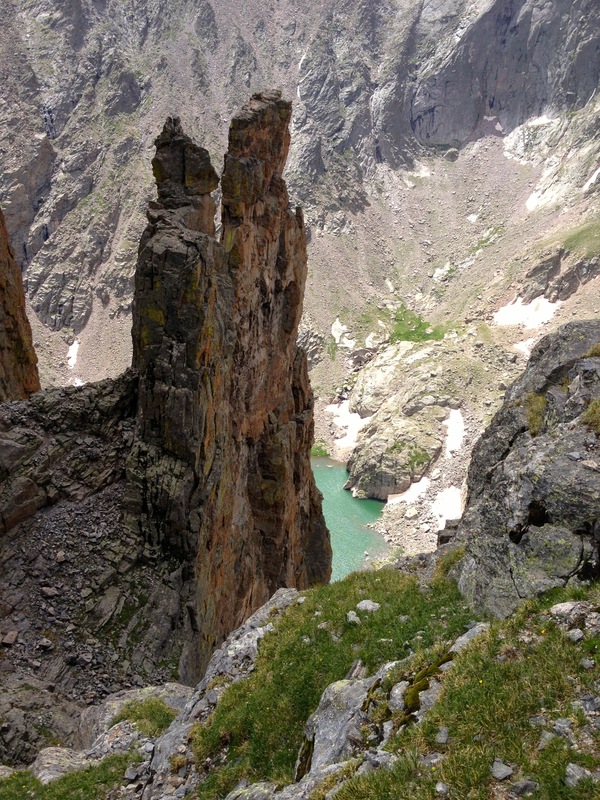 In fact, on the 11th, we decided to climb at Eldorado Canyon State Park due to the forecast; but at the very last minute, we decided to go for it. We were worried about losing the season and not being able to finish until the next summer. To give ourselves a better chance of beating the rain, we started hiking at 4:30am. Unfortunately, the rain started @ 5am. It is a strange experience to hike in the dark while it is raining. My initial reaction was, of course, disappointment; but quickly I realized that it was early enough to go back to Eldo and still get a full day. 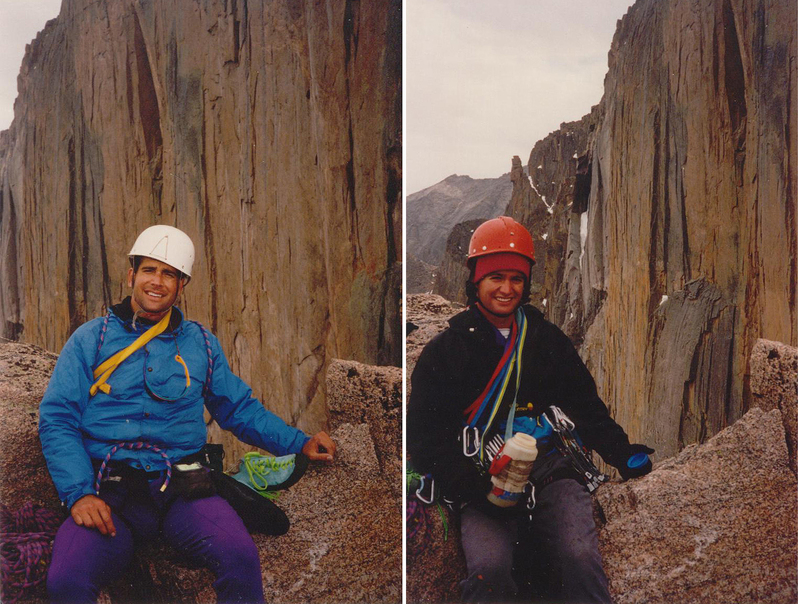 Brian again convinced me to press on with the reasoning that the rain might stop and the rock would eventually dry. The rain didn’t stop until we reached the base of the climb at 7:30am. We sat for a minute to ponder our fate, but the cold temperature and wet conditions had us shivering before long. 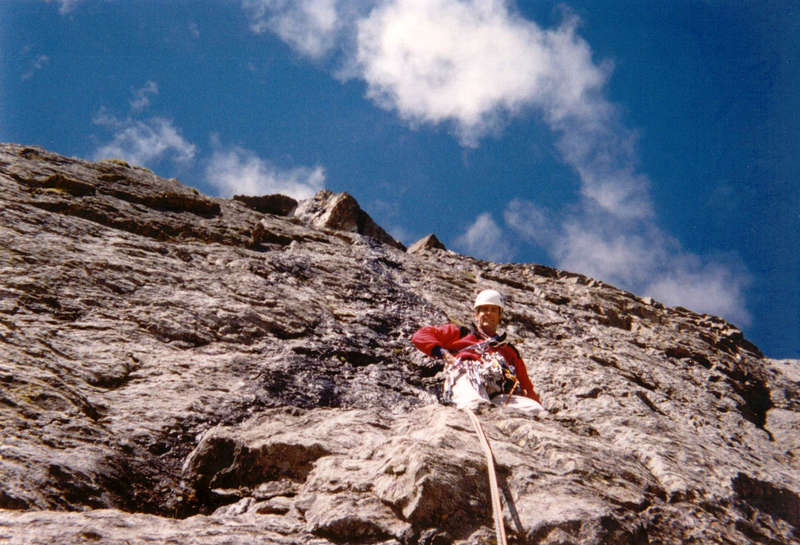 We decided that it was possible that we could climb up the decent route, and quickly started scrambling up to the start. On such a bad weather day and with our early start, we correctly guessed that we wouldn’t be in anyone’s way. 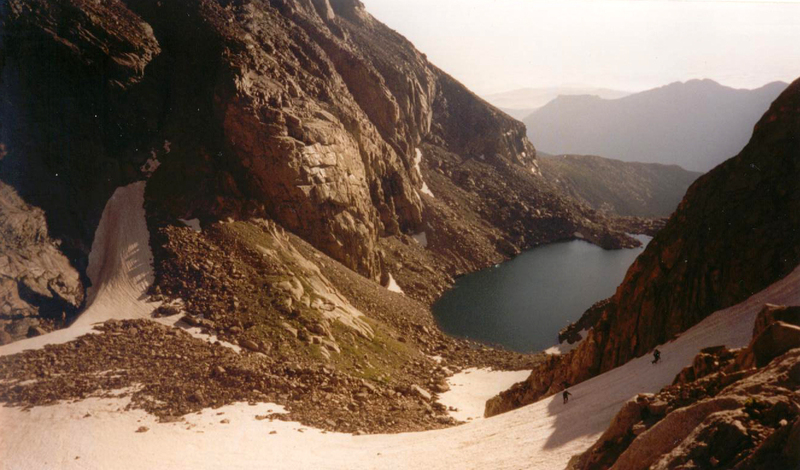 Once we reached the descent gully, we could see it was full of snow. Rather than give up, we decided to climb in our hiking boots. We knew the rock from previous visits and knew we could bail at any time. 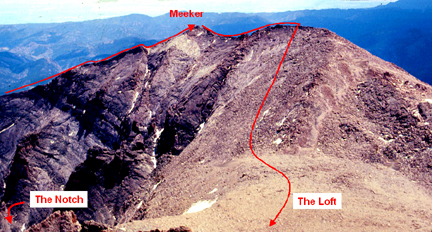 And while the climbing was slick, we progressed steadily and reached the summit by noon. 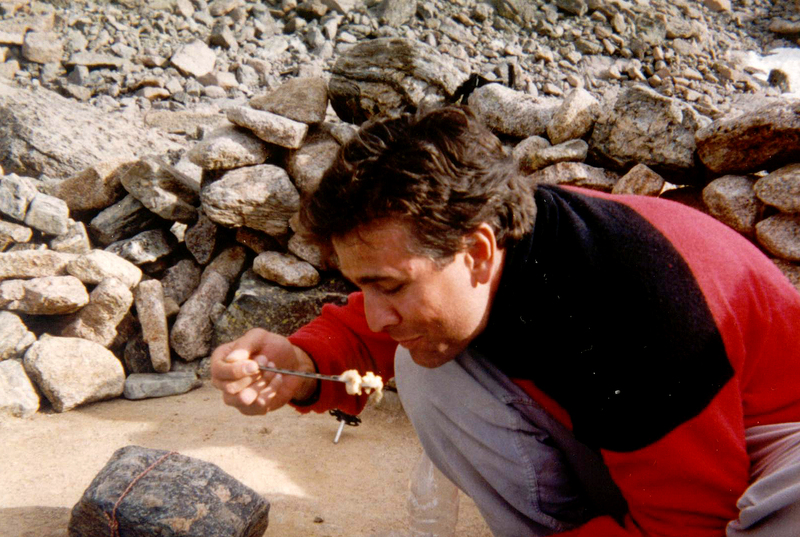 We both insisted on a stop for lunch, and as we ate and shivered, we enjoyed our latest “alpine” experience. The descent was uneventful and we arrived back at the parking lot after a 10 hour effort. 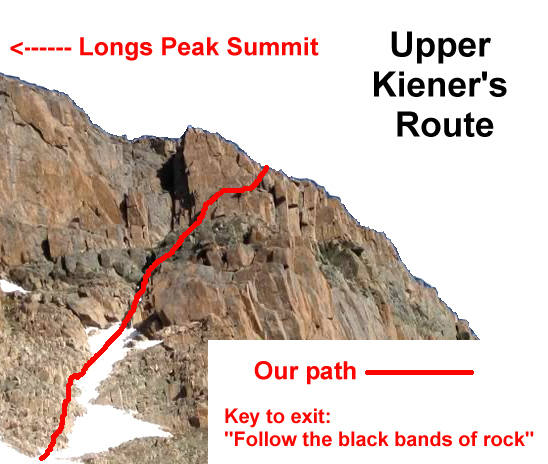 On the drive home, Brian made sure I understood that we had to go back to finish the North Face route. Who was I to disagree? 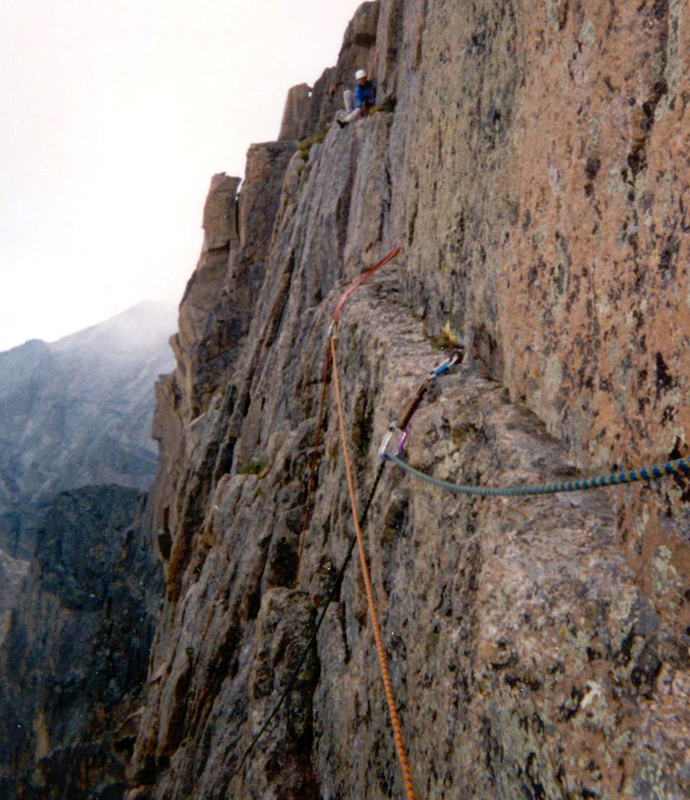 Against all the odds, the RMNP rock climbing season stayed open for another week (actually two additional weeks, but that is another story). 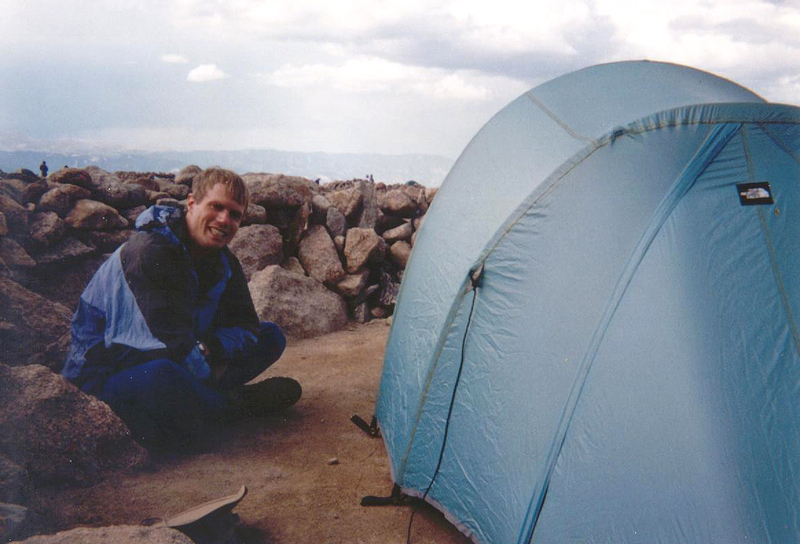 With a good weather report, we set out for Sharkstooth once again on September 18, 1999. To give us an even better chance for success, we started hiking at 4am. This meant we’d be in darkness for nearly all of the approach, but we absolutely didn’t want to miss what was almost certainly our last chance for the next 6 months. 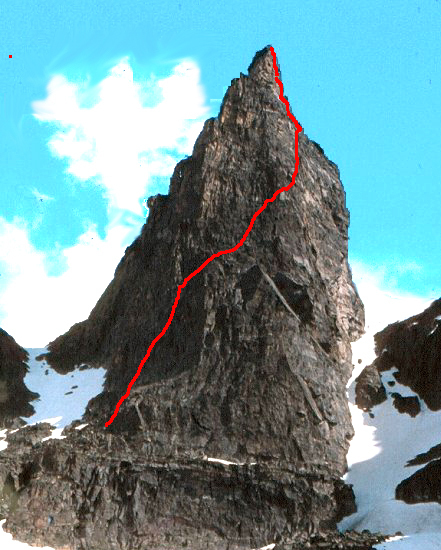 The completed North Face route on The Sharkstooth. 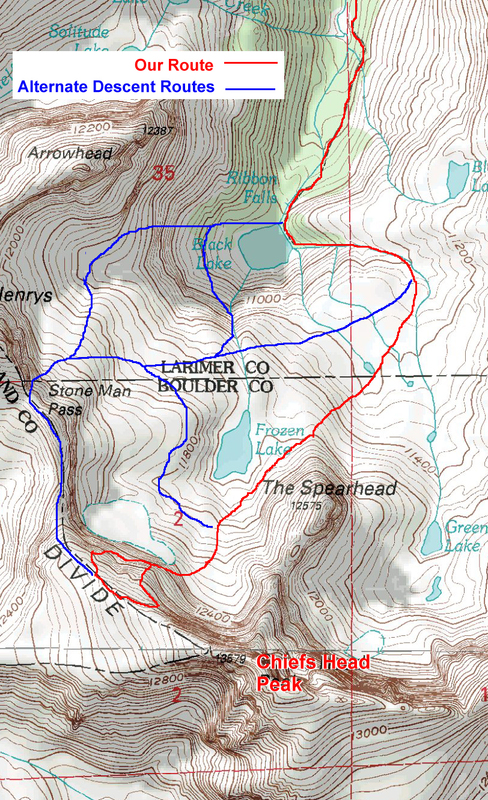 Hiking over broken ground in the dark is hard, but we knew the trail better than most after 3 trips in the last 4 weeks. And we almost made it without mishaps except for an overhanging rock that clipped my cheekbone as I sped by while my headlamp and attention were focused on my footing. 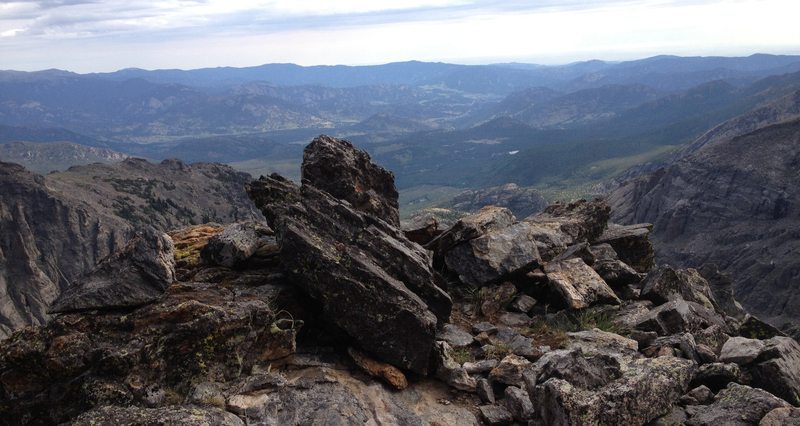 But without a serious delay we still reached the base of the climb at 7am…and we found beautifully dry rock. Oh, the joy! 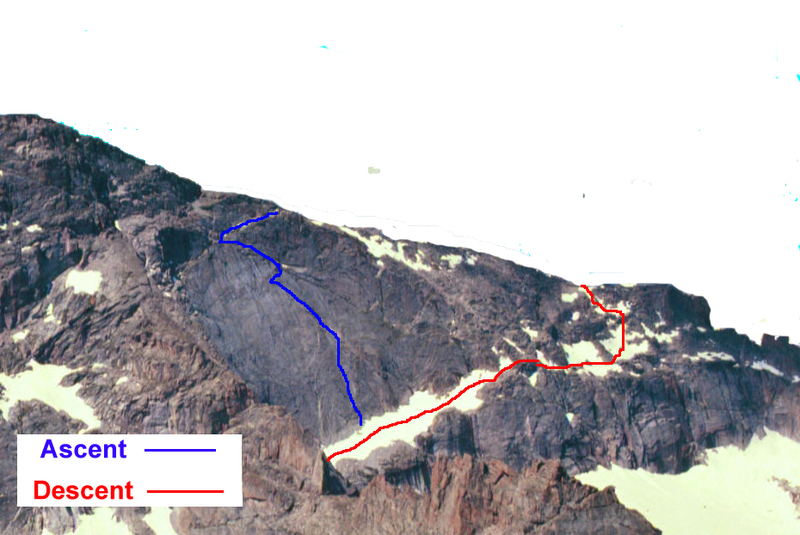 Our goal was to complete the climb by 11am, which was the time of the rainfall that ended our initial attempt. We knew the initial pitches very well and cruised up quickly. The last two pitches were very interesting…and hard. It was my opinion that if we had pushed it on our initial attempt, we’d have gotten into serious trouble. We reached the summit at 11am and enjoyed the fruits of Brian’s persistance. 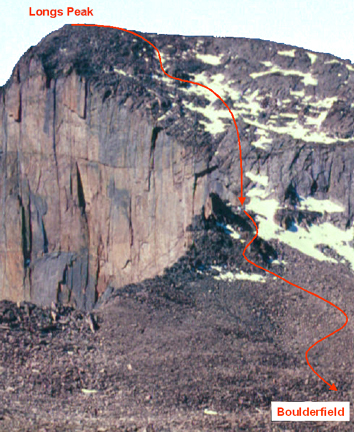 Unfortunately, when we tried to leave, we had to share the descent gully with a team of 6 climbers climbing up the East Gully route (5.4). 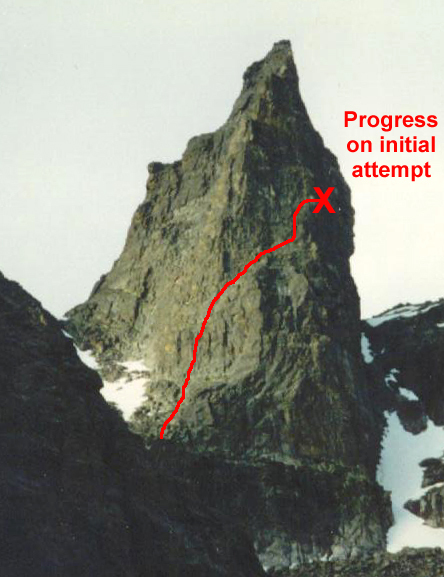 Through excruciatingly slow movement and brain numbing care, we managed to avoid knocking down any rocks or pebbles and made it back to the base of the climb and our packs. A very fast hike back (1 hour 40 minutes) got us back to the parking lot in time for some guiltless football watching.